Since the last Government introduced above inflation rail fare rises in 2003, the story has been the same every year: higher prices for over-crowded services. Astonishingly, even now they’re in opposition, the Labour Party still want fares to go up by 1 per cent above inflation. Unsurprisingly, Conservatives like Osborne want to punish people even more with RPI+3% rises. The Lib Dems and I want rail fares to come down in real terms – they should go up by no more than 1 per cent below inflation. Coalition is about compromise, so we agreed to an interim cap of RPI+1 for 2012; in between our position and that of the Tories. But, without continued pressure on the Treasury, fares could go up at the higher rate, to a level which would be simply unacceptable for commuters in Cambridge and across the country. Tomorrow, the July inflation figures will be published. These are the figures which the fare rises will be based on. 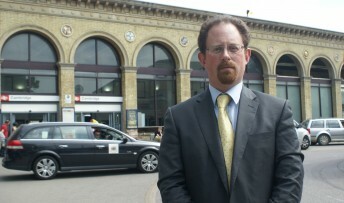 I will be making clear that rail fares cannot be allowed to go up to the level some Tories are suggesting. For far too long, Government’s have mismanaged our railways and passed on the cost to commuters. That is why our railways are 40% less efficient and 30% more expensive than European counterparts. Tickets went up 66 per cent in cash terms between 1997 and 2010 – 13% in real terms. To its credit, the Coalition is investing more in our railways than at any time since the Victorian era. There is no better way to reduce fares in the long term than by making our services more efficient, and increasing the number of users. But we can’t just pass these costs on to rail users. Family budgets are very tight, people need to be able to find work and get to interviews, and nobody should be punished for using public transport. I hope the Treasury will think again before punishing commuters in Cambridge. The traditional role of the government has been to provide for the security, infrastructure and health of its citizens. To fund this, a system of taxes exist for all its citizens (both on earned income and on other transactions). It is alarming therefore, to find that the government is shirking its own responsibility towards its citizens by insisting that a large chunk of cost required in infrastructure development come from people using a service. This amounts to double taxation and goes against the simple traditional systems of governance – we pay taxes, the government uses it for things like hospitals, transport, education, state security etc. Why have the successive governments in the UK forgotten this? It also goes against the principles of green transport policy by making journeys by car relatively cheaper and more attractive to those who cannot afford to pay these ridiculous amount by way of rail charges (the highest in europe and possibly the whole world). A similar skewed transport policy operates in Cambridge, where it is cheaper to take a car and park in the town centre than to buy 4 tickets on the bus!! But being British, we will do what we do best – mutter to ourselves, shrug and carry on, and allow the government to take us for granted yet again. Please maintain pressure on the treasury and the DfT to reduce the costs of train travel in real terms. The situation with regards to train travel in the UK is ludicrous. Mr Swaminatham’s point about double taxation is extremely pertinent – the Government need to start waking up to the fact that the public is sick of seeing their money being funnelled into the huge profit declarations of corporations who provide, at best, a very mediocre service. Our taxes should pay for infrastructure improvements, and the train companies should not be allowed to negotiate contracts that are based on rinsing travellers out of every last penny. Train fares must be reduced if the UK is serious about encouraging public transport and stimulating business.